Peru is carrying out a strategy to eliminate mother-to-child-transmission of hepatitis B. The most important preventative intervention is the universal vaccination, which can prevent infection in 95 per cent of cases. Ahead of World Hepatitis Day – observed annually on 28 July – the United Nations health agency has said it plans to release new testing guidelines for hepatitis B and C, among other action, in an attempt to encourage testing and reach the 95 per cent of people who are not aware they are infected with the disease. Together with its partner, Social Entrepreneurship for Sexual Health, the World Health Organization (WHO) said it recently launched #HepTestContest, a global contest to show how the testing guidelines could translate into real action on the ground. “We needed examples of innovations and best practices to help guide and inspire others,” said Philippa Easterbrook from the WHO Global Hepatitis Programme, who co-led the project. The contest received 64 contributions from 27 countries, WHO said. Five finalists were selected by a panel of experts including representatives from WHO, the World Hepatitis Alliance and Médecins sans Frontières, who reviewed the testing models for innovation, effectiveness, and plans for sustainability. In addition to national testing campaigns, approaches included testing in prisons, testing in the workplace and hospital emergency rooms, integrated HIV-hepatitis testing, as well as the use of internet, social media, and electronic medical records to flag higher-risk patients for testing in primary care. Know about Hepatitis. Act Now. “From prisons in Australia, use of an internet-based risk self-assessment tool in the Netherlands, community testing camps for drug users in India, to testing in primary care in Mongolia we learned some great lessons about how to build awareness of this hidden disease, improve testing rates and link those infected to treatment and care,” she added. An important feature of the approach was the strong community involvement and support as well as strategic partnerships to leverage reductions in the price of treatments, WHO said. “Bringing together pharmaceutical companies, government, research organizations and communities to help negotiate price reductions make hepatitis treatments more affordable,” said Ms. Easterbrook. “The contest demonstrated a range of possibilities. It showed that if we can develop acceptable testing approaches to suit different contexts and cultures, then we can increase effective hepatitis testing in more countries and communities,” she added. In May of this year, the World Health Assembly – WHO's decision-making body – called for treating eight million people for hepatitis B or C by 2020, to reduce new viral hepatitis infections by 90 per cent, and to decrease the number of deaths by 65 per cent in 2030, as compared with 2016. These targets are part of the first ever Global Health Sector Strategy on viral hepatitis. The theme of this year's World Hepatitis Day is Know Hepatitis; Act Now. 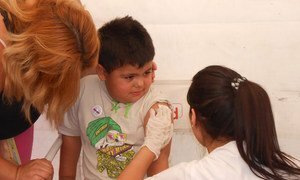 With some 400 million people around the world infected with hepatitis B and C, the United Nations health agency today encouraged countries to boost testing and access to services and medicines for people in need.